Shop to Give” with the Charity Fairs Association. Seres is proud to be a member of the Charity Fairs Association, but what is it and why should you care? The Charity Fairs Association is a collaboration between local and national charities and independent retailers. Together they provide a nationwide network of quality gift fairs which raises awareness of charitable causes and money for their continued support. What makes a Charity Fair Association Event Different? First of all, quality. Rarely do you get such consistent quality stands under one roof. Every stallholder has been through a selection process which ensures a superb choice of quality gifts for everyone. Ranging from artisan foods to – well, the luxury of Seres Gifts – there’s something for everyone and every budget. Secondly, location. Venues for the events are fabulous and range from converted barns and glamorous marquees to stately homes! How does money get raised? Each stallholder pays a fee to exhibit at the event. They generally give a percentage of takings too (normally 10%) and donate a raffle prize. Also, each visitor pays an entrance fee, thus helping raise more funds. Additionally, there is normally a wonderful array of refreshments on offer from the hard-working organisers. Again, these help raise funds. Sometimes, the organisers host Gala Evenings where tickets are bought in advance. These generally come coupled with welcome drinks and nibbles! 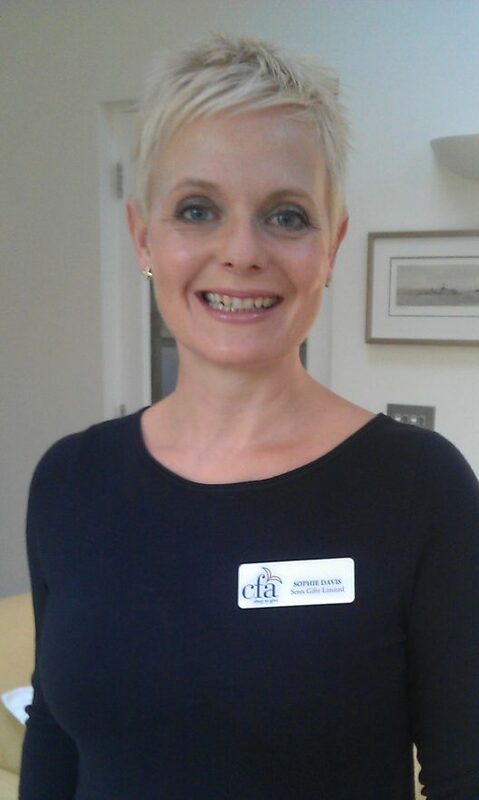 Sophie from Seres proudly wearing her CFA badge! In addition to the quality and the venues, Charity Gift Fairs are extremely personal events. You are welcomed by Committee Members who genuinely care that you have chosen to support them. Likewise, stallholders are there to make your experience enjoyable. Your support really does make a difference huge. You should get that warm, fuzzy feeling that you’re doing some real good whilst shopping! Now, that’s a feeling worth having! One final point. The Charity Fairs Association has been going for over 30 years. Some of you may be long-standing supporters. Some of you may have never heard of it. One thing is certain. The funds raised are as important now as they have ever been. In short, it is only through your support can this fabulous work continue so please take the time to see if there is an event near you that you can support. Thank you!